The much anticipated Dell XPS 15 2-in-1 will launch this week if a tweet by Dell's Frank Azor is anything to go by. The launch of the Intel 'Kaby Lake-G'-powered convertible has eluded fans ever since it was announced at CES 2018 and Azor's tweet could offer some respite for those looking to lay their hands on one. 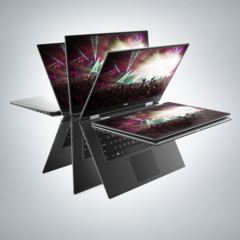 The Dell XPS 15 2-in-1 9575 was announced at CES 2018 in a rather unconventional departure from the original XPS 15 design language. The notebook sports a convertible form-factor and is powered by the new Intel-AMD 'Kaby Lake-G' chips. 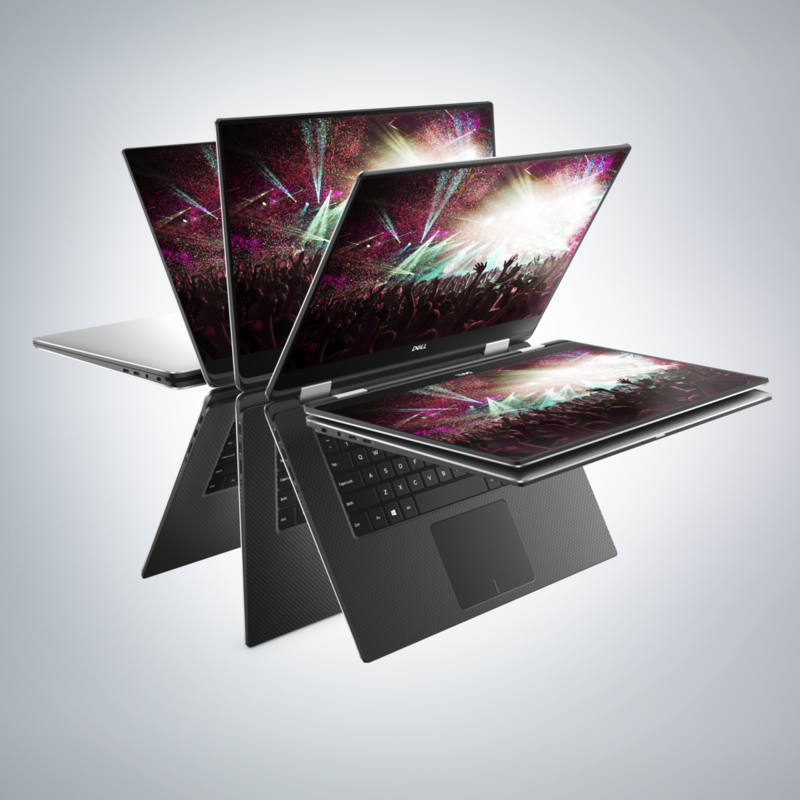 Dell stated at CES that the notebook is slated for a Spring 2018 launch but the actual launch date has eluded prospective buyers thus far. Dell's VP General Manager of Alienware, Gaming and XPS, Frank Azor, once again took the opportunity to clarify the uncertain. 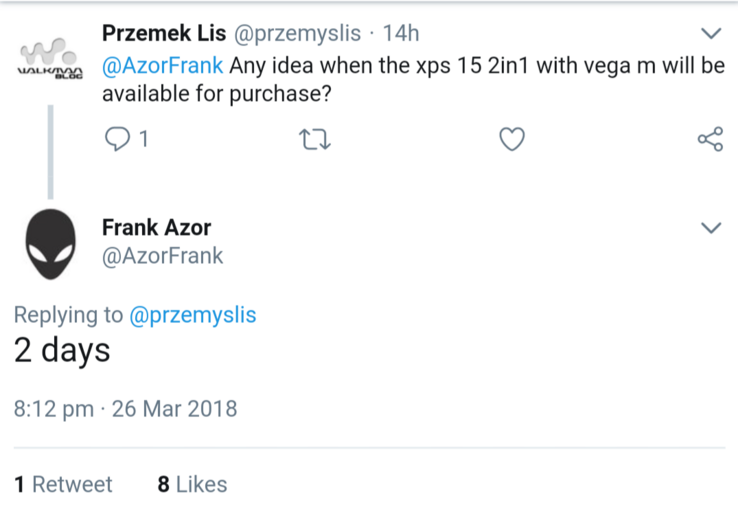 In a reply to a user's query on Twitter, Azor said that the XPS 15 2-in-1 will launch in 2 days. The XPS 15 2-in-1 will give us a taste of what the new Intel 'Kaby Lake-G' chips have to offer. The convertible will sport either the Core i7-8305G/Core i7-8705G, which have a package TDP of 65W. An intriguing aspect would be to study whether indeed the RX Vega M GL GPU fares similarly to an NVIDIA GTX 1050 Ti as advertised by Intel. While we definitely look forward to test the new XPS 15 2-in-1 when it arrives at our doorstep, our initial impressions with the notebook were slightly marred by the high chassis temperatures under load, lack of legacy USB-A ports and standard-size SD card slot, and the Mag-Lev keyboard, which has a shallow key travel of just 0.7mm. The new XPS is not the only 'Kaby Lake-G' sporting notebook to watch out for. There's also the HP Spectre x360 15 powered by the Intel Core i7-8705G that is also expected to make its debut this Spring. A recent listing of the Spectre x360 was spotted on a Finnish retailer's website, which saw the notebook going for Euro 2099. The Dell XPS 15 2-in-1 will retail at a starting price of US$1,300 and comes with a host of memory, display, and storage configuration options.